In 2010, we recorded local people and Northumberland National Park staff talking about the Breamish Valley and produced 40 x 2-minute sound clips and loaded them onto 5, sustainable sound boxes that have been located at strategic points in the valley. Audio provides a un-intrusive means of delivering interpretation and can be delivered in a number of different ways. Focus group research showed that young adults, an audience under-represented amongst visitors to the National Park like to use apps. 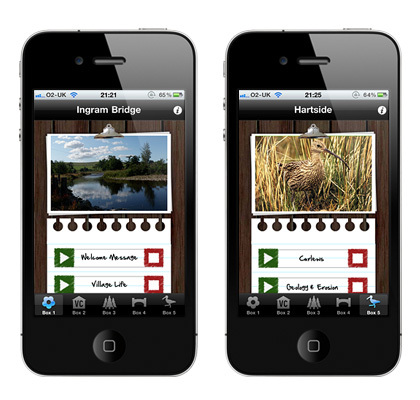 Will an app about a beautiful valley in the National Park encourage them to visit? Will other audiences use it too? 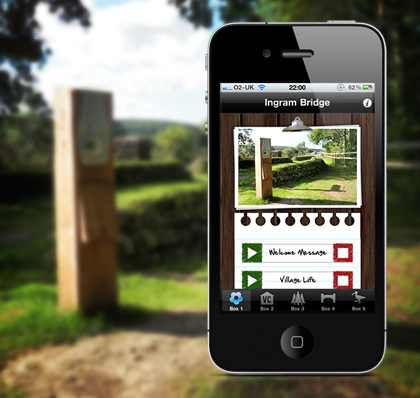 Commissioned by Northumberland National Park Authority, The Sounds of the Breamish Valley App uses the existing sound clips, supplemented by images relevant to each clip, to deliver the audio interpretation of the valley via iPhones (Android version in the pipeline). Promotion of this ‘pilot app’ will be monitored to obtain user feedback on the interpretation, using the app and on whether visitors are prepared to pay a small download fee, part of which will be paid into the ‘Good Nature Fund’, helping fund countryside management in the area. The Sounds of the Breamish Valley iPhone App is now available to download in the App Store.